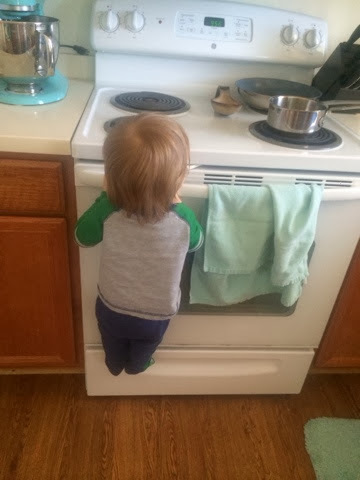 No one prepared me for a toddler! D is 24/7 on the move and I'm right behind him. I officially have a daredevil that gives me heart attacks all day long. I'm not talking about climbing the steps when I am not looking. 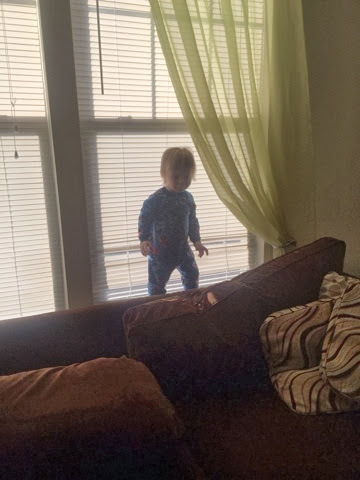 I mean he is climbing the TV, standing on the window ledge, doing pull-ups on the stove, checking out the top of the dining room table, and using his toys for height when nothing else will do. He's on the move and he is not scared of anything! Speaking of toddlers can we talk hair? I just cannot bring myself to cut these luscious blond locks. Everyone seems to tell me I need to (are you his mother or am I?) and I just can't. I have dreams of long (not too long) surfer looking hair on my adorable child fully knowing his dad down the road will have him in a military cut before I know it. I love how his hair curls out under his hats and the fact that I may or may not have to use product in it to keep it parted to the side. I just love it and it is growing at such a fast pace. Listen if I am willing to comb and style it why is it anyone's area to tell me it needs to just be cut? J seems to be on board with keeping it long (for now) although he does say if I want to cut it we can. Took him long enough to even say it can be cut, but I think he knows mama bear just isn't ready to let go of it. I was amazed by you. the way you create a website very thorough and good. This is very very impressive. I appreciate that you produced this wonderful article to help us get more knowledge. Trying the big task and finishing it off and getting good comments and ratings. That is one hell of a job done!